A group dealing with rheometry (characterization of non-Newtonian materials) has a long-term experience both in academic (frequent contributions to renowned international journals) and applied (analysis of concrete industrial materials) spheres. Target groups are represented by industrial companies, technological centres and research institutes interested in characterization of non-Newtonian materials, i.e. the organizations dealing with polymer processing, cosmetics and food technology. Rotational rheometers (Anton Paar MCR 501, Anton Paar MCR 702) equipped with various geometries (plate-and-plate, cone-and-plate, concentric cylinders) and rheological cells (the electrorheological one of a type plate-and-plate but also with concentric cylinders; the magnetorheological one of a type plate-and-plate equipped with precise measurement of intensity of magnetic field and temperature). 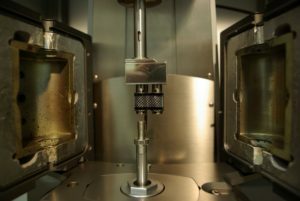 An in-built part of the temperature oven is a camera enabling continuous recording of the chosen characteristic including elongational viscosity using a Sentmanat Extensional Rheometer). A precise Peltier system for temperature setting (up to 200 oC) can be used as well. A two-piston capillary rheometer (Rosand RH 2200) is equipped with four dies (with diameters (0.5, 1.0, 1.5, 2.0 mm) and five pressure transducers. 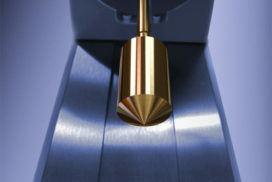 For measuring of suspension characteristic it is possible to use conical dies. 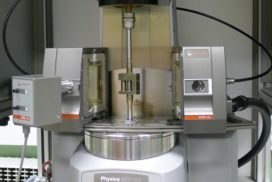 Using thermal and cooling presses it is possible to prepare material samples of required dimensions from raw polymer pellets, emulsions and suspensions can be prepared using vibrating shakers, magnetic stirrers and sonicators. For analysis of nanofibrous materials there is applied a scanning electron microscope VEGA 3 (producer Tescan), for determination of their hydrofilic or hydrophobic properties a device See System E.
Rheological analysis is understood in the sense that not only shear but in the case of polymer melts an elongational viscosity can be determined as well. Measurements relating viscous and elastic components (loss and elastic moduli) can be carried out as well. Temperature can be increased up to approximately 400oC. These characteristics can be also measured in the electric and magnetic fields. Analysis of materials processed by an electrospinning method from the viewpoint of rheology including hydrophilic and hydrophobis characterization.